Hello, everybody! 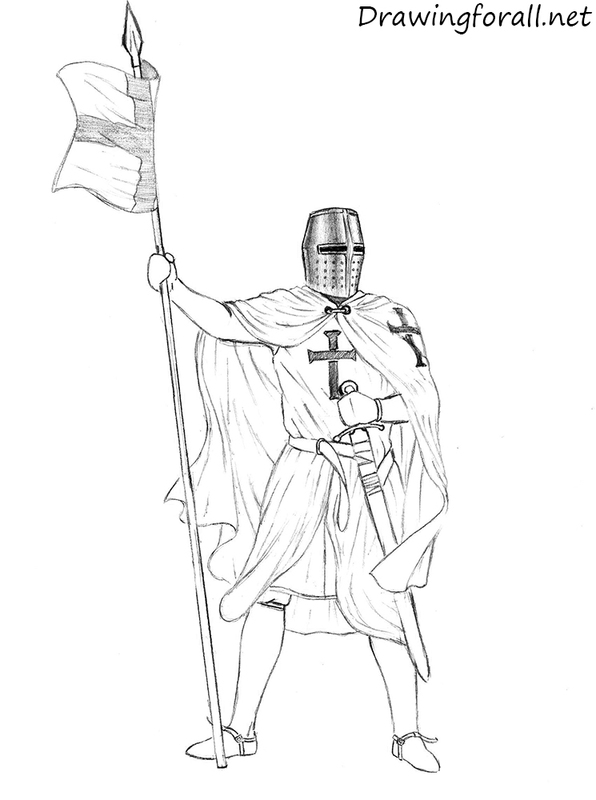 In today’s drawing lesson we will show you how to draw a knight. 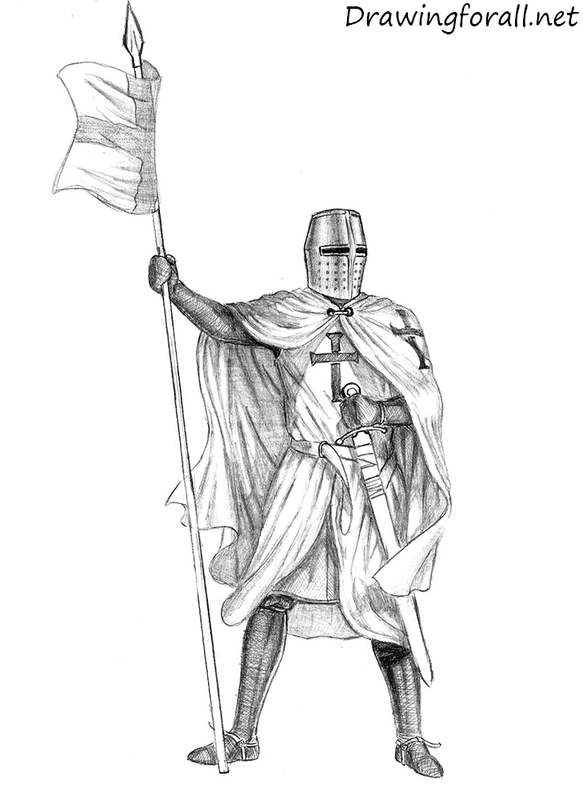 As everyone knows, the knight – is not just a warrior who fought with dragons in the medieval epic. 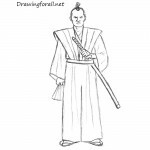 As the samurai, knights were not just warriors, but special representatives of the nobility. 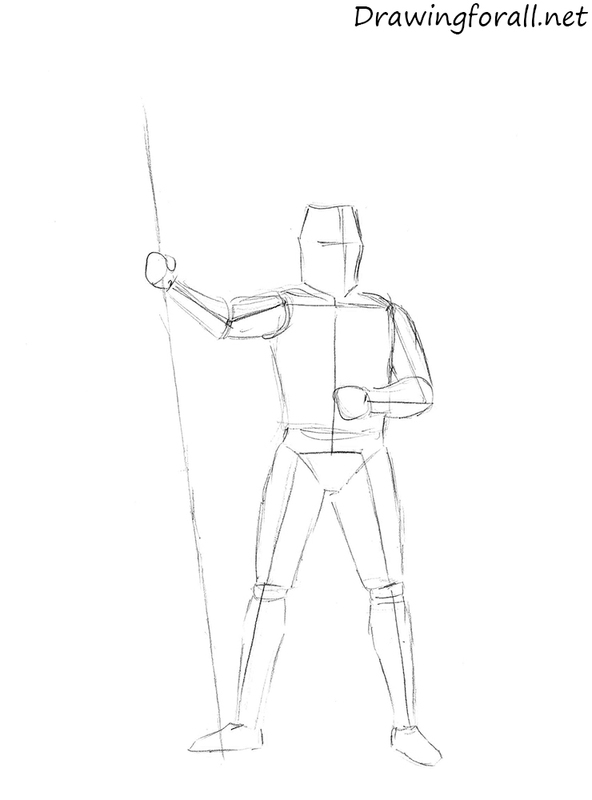 So, let’s start the drawing lesson and learn how to draw a knight. 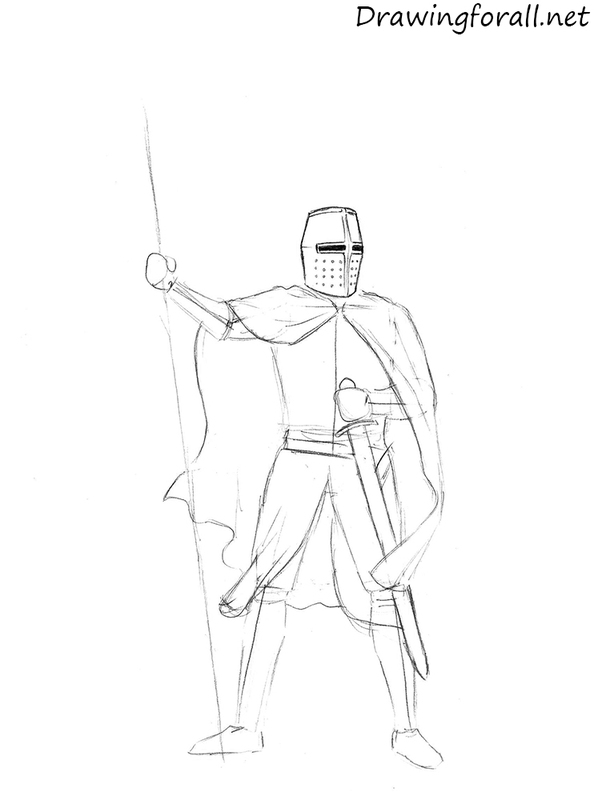 At first let’s sketch out the skeleton of the knight. 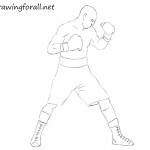 Draw the outlines of the head, using an oval. Right below the head draw the spine, which is equal to two heights of the head. Sketch out the guidelines of shoulders. The width of each shoulder equals to the width of the head. 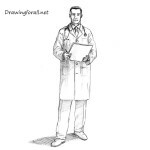 Draw the guidelines of the shoulders. Draw the guidelines of the legs. The height of legs is equal of the height of the spine. At this step, we will add some flesh to the knight. Sketch out the helmet on the head of the knight. Using a big cylinder draw the outlines of the torso. Draw the arms, each of which consists of two equal cylinders. Sketch out the hands. 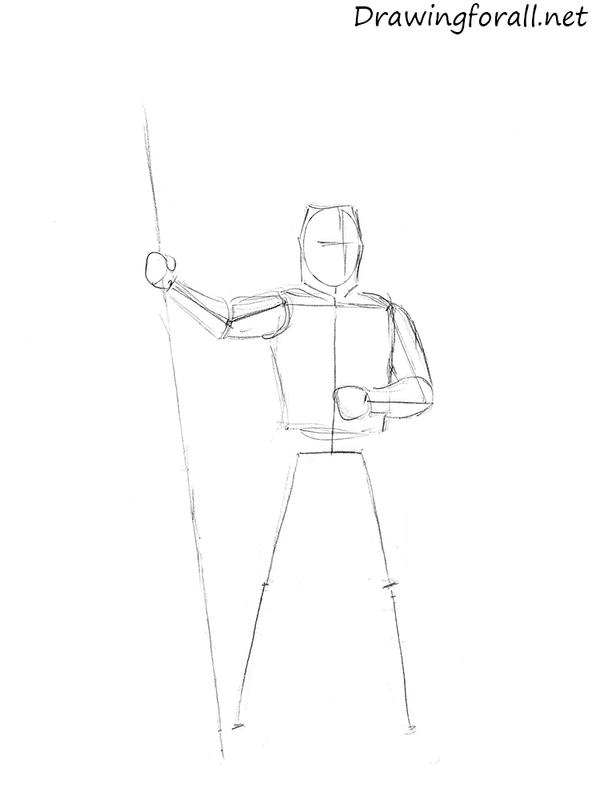 Using long and straight line, draw the spear in the right hand of the knight. Sketch out the triangular pelvis. 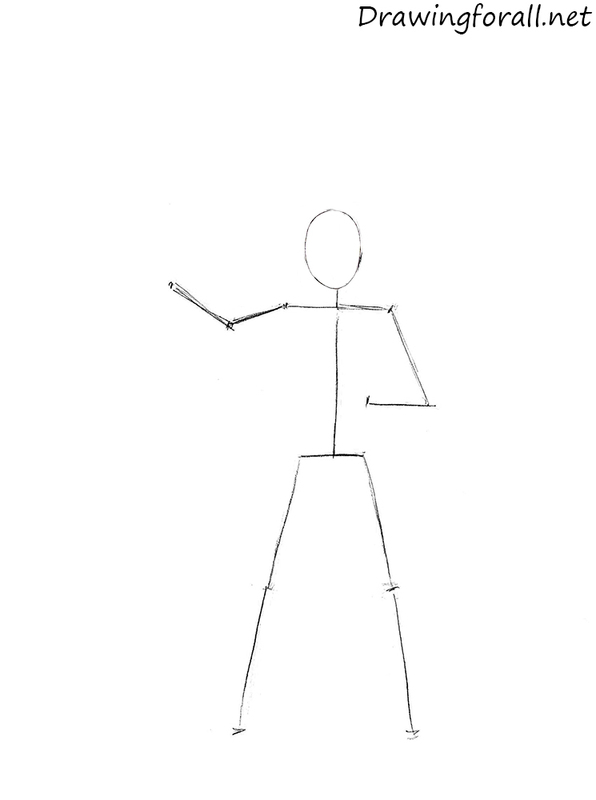 Using cylinders draw the legs, and outline the knees. Note, that the thigh and shin of about the same size. Draw the outlines of the feet. The main shapes of the knight are ready. Now a bit of work on the cloth. Using curved lines draw the outlines of the cape then add some folds to the cape. 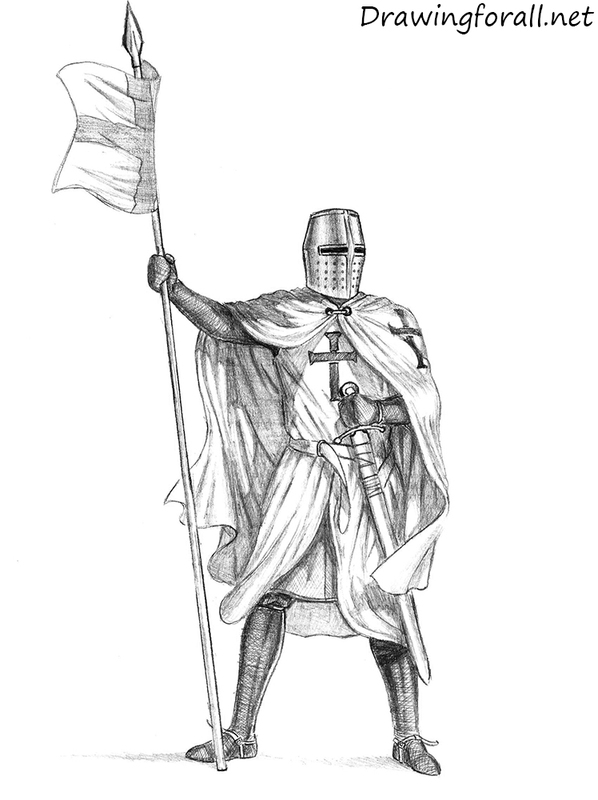 Clothing, worn over the armor. Sketch out the belt and sword as in our example. 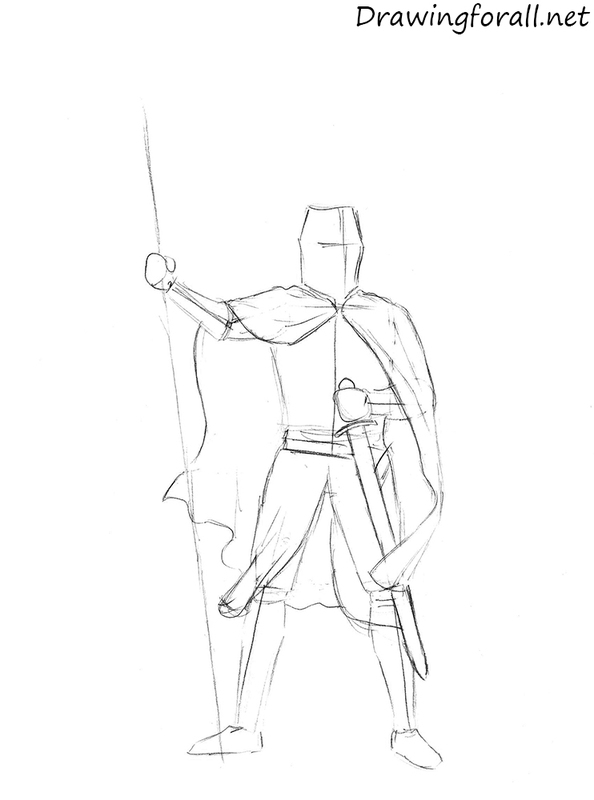 We have a ready silhouette of the knight, and from the next step we begin to add details. Erase the guidelines from the head. Circle the lines from the head to make them cleaner. Using the lines of the facial symmetry draw the openings for the eyes and the vertical weld. Draw the details of the helmet as in our example. Erase the guidelines from the cape and arms. Circle the lines, making them cleaner. Draw a cord with two buckled just below the throat. Add the folds to the cape. Please note that the fabric follows the contours of the body. Draw the spear. Erase the guidelines from the torso. Circle the lines and add the folds to the fabric. Draw the cross on the center of the chest. Draw the belt, that tightens the waist and creates folds on the clothes. 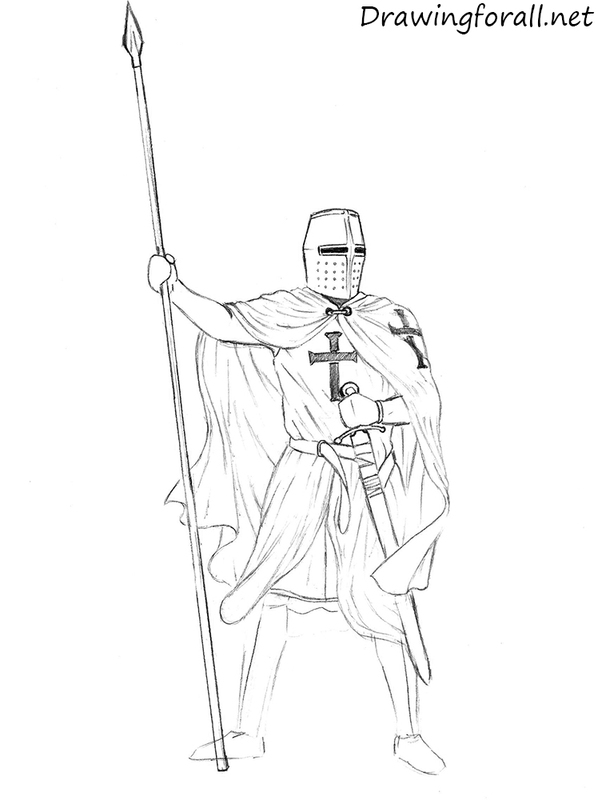 Draw another cross on the left side of the cape, but do not forget to take into account the folds in the fabric. 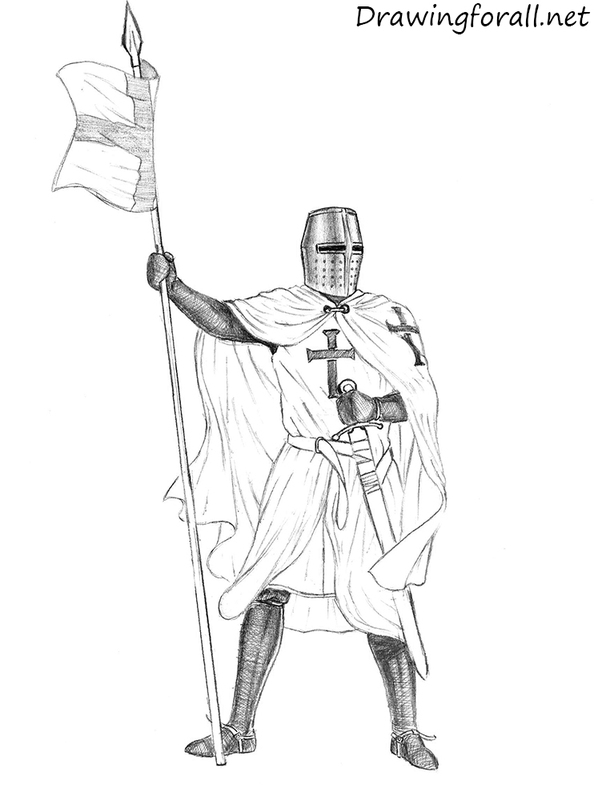 Draw the left hand, sword and straps on the sword. Erase the guidelines from the cape and lower part of the surcoat. Using curved lines draw the folds of fabric on the clothes. Under the cloth draw another layer of clothing. Erase the guidelines from the legs. Mail sits a pretty tight on the feet, so that draw the outlines of the calf muscles. Draw the straps on the legs as in our example. Draw the tissue with a cross at the end of a spear and add some folds. So, the knight is ready, and from this step we will add shadows and final touches. Using vertical strokes draw the shadows. First draw the darkest areas of the shadows, trying to indicate the cylindrical shape of the helmet. Then, using more light strokes, denote the transition from shaded areas to light. 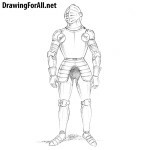 Continue the drawing lesson on how to draw a knight. Using cross hatching draw the mail. Note, that the texture of the mail should follow the shapes of the muscles. Then, using dark strokes add shadows to the arms. As last step, add the shade to the legs. To give more realism, leave narrow reflex strips of light (the light that is thrown on the knight from the bright surface of something) on the inside of the lower leg in the area of the calf muscles. Especially thick shade will be thrown by the surcoat. At this step let’s work on the shadows on the clothes. This step seems too difficult, but it isn’t so. At first we need to find the source of the light. As you can see, the light comes from the upper right side. So we need to add shadows to the areas where no light is falling. To draw the shadows, use very dense hatch. 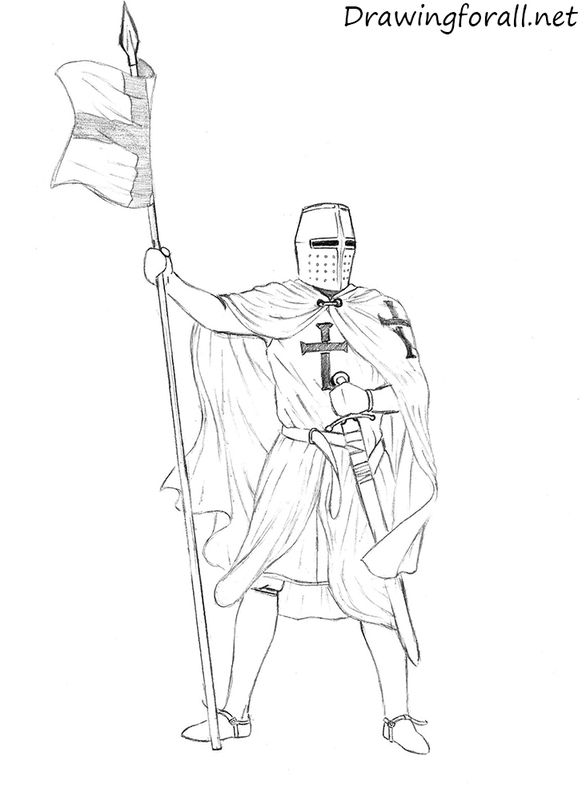 So we got to the last step of the lesson, in which we draw a knight. Using light hatching draw the casting shadows as in our example. Watch on your drawing, erase the unnecessary strokes, and make the last touches. 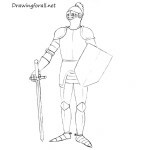 It was a difficult drawing lesson about how to draw a knight by Drawingforall.net. If you can not deal with this drawing from the first time, don’t worry – continue to draw and practice.